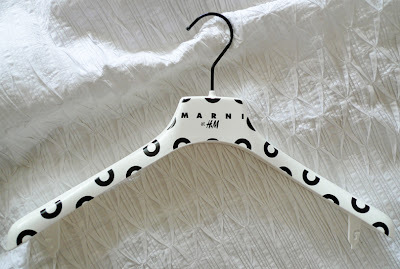 Did you shop the Marni for H&M collection on Thursday? I admit, after my massive fail at Wednesday's preview shopping evening, I did go back for a second attempt. When I got to the Oxford Circus store in London just before 9am, there wasn't much of a queue. I was surprised. Little did I realise that people had been queuing since 3am and had already been allocated timed wristbands with their 10-minute shopping slot! My wristband time? 10.55am. So I went to work, took an early lunch break and returned to shop. Sadly, no, I didn't get one of the collar necklaces. But they are lovely. Why don't you have a go at making your own? I should do a craft-y blog post about it! Marni for H&M launches tomorrow!